Anti wrinkle injections are a made from natural, purified protein that was initially created to medically treat “Crossed eyes” in 1978. More and more medical uses have been approved by the TGA for its use over the years including cerebral palsy, excessive sweating and migraines. Anti-wrinkle injections are most commonly used to reduce lines and wrinkles by relaxing muscle movement. The muscle therefore cannot contract and cause a ‘movement’ in the skin that causes wrinkles. Anti-wrinkles injections are not only used for wrinkles, but in conditions where there is excessive muscle movement. For example, very square, pronounced jaws are usually a result of overactive masseter muscles. They have a variety of uses, from reducing wrinkles, to reducing sweating, reshaping your jaw line and reducing a gummy smile. Overtime wrinkles can form on the face due to use of the muscles resulting in movement. Some wrinkles become static so can been seen even at rest. Anti-wrinkle injections can be used to reduce the appearance of wrinkles and can also prevent them from forming. The most common areas are frown line, forehead and crows feet. The jaw can appear somewhat square when the main jaw muscle, that is, the masseters, are overworked. Just like building muscle at the gym, repetitive use will grow the muscle. For women, anti wrinkle injections can be used to reshape your jaw to a softer appearance by injecting muscle relaxant into the masseter muscle. This allows to the muscle to relax and reduce in size, creating a softer, more angular look. For men, anti-wrinkle injections can be used to create a more defined, square jaw. Anti wrinkle injections have also been used in this muscle for a reduction in teeth grinding with proven efficacy. Neck bands occur due to the ageing process and are a result of overactivity of the muscles that maintain the contours of the neck,- the Platysma. When this occurs, it creates a downward pressure on the jowls, resulting in a saggy appearance and a V-Shape from the top portion of the neck to its base. Anti-wrinkle injections can be administered into the side of the neck to dramatically reduce the appearance of saggy jowls. To achieve the “Nefertiti Lift”, injections are also placed at the front of the neck as well as the sides. A “gummy smile” is when there is an over prominence of gum tissue when you smile with the lip generally turning upwards. This can result in feelings of self consciousness and rarely showing off your smile. If the muscle that controls the movement of the upper lip is hyperactive anti-wrinkle injections are effective in treating Gummy Smiles. Anti-wrinkle injections will relax this muscle, causing a drop in the lip, reducing the amount of gum tissue exposed when you smile. Anti- wrinkle injections work to correct a drooping brow line by subtly “lifting” the brow. 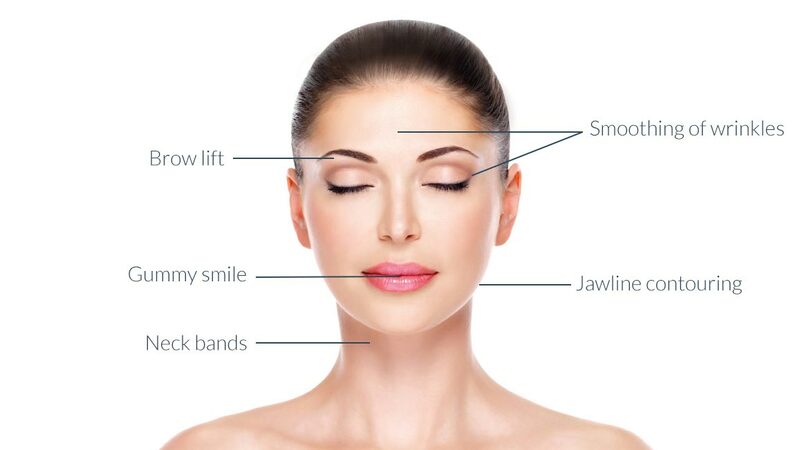 Anti Wrinkle injections are strategically placed into the outer areas of the eyebrows into the same muscles that are responsible for pulling down the eyebrows. The result is a subtle “lift”, that is, millimetres, in brow placement. This can also correct asymmetry of the brows and create a more balanced result. Anti-wrinkle injections can also be combined with Dermal Fillers to create the perfect brow. Here, the dermal filler is placed under the eyebrow or the middle half of the upper eyelid, depending on required results.